IN VOICEOVER and in many other industries, our websites are our store fronts. Because most of us work out of our homes, we don’t see much street traffic – although clients do come over to the house to record from time to time. It’s a great way to force yourself (or my children in my case) to clean the house. So we as voice actors try to make sure we make the web site SEO friendly, make sure the menus flow well, make sure the content is informative, timely and fits our branding message. Of course, we want it to be attractive and inviting as well. Some more obsessive website owners (whomever they might be and they might have an apostrophe in their name…or not) are always looking for unique and sometimes very subtle ways to gain a viewers attention or peek their creative interest by showing something visually (as well as ‘audiolly’) cool. And then sometimes you include something in your voiceover web site just because it makes you happy. Truth be told, THAT’s the reason I included the above graphics on my voiceover agent page on my web site. Some will look at the page and this blog post as a way for me to be bragging about my agents…I can only tell you this post is sincerely not meant that way. I wanted to share with you the creative process I went through to create this in hopes that maybe it will spur you on to create something new and unique to your own web site, something unique and specially that you hadn’t thought about adding until reading this. Onward, then. I was looking at other voice talent web sites for a completely different reason and noticed a voiceover agent page that featured logos of that’s talent’s agents. Many of us try to include our agents on our web sites to give them recognition and possibly leads for those folks who prefer to book voice talents not directly via the talent but rather by an agent. Fine by me! In a previous incarnation of this page, I had included a graphic of agency logos but I thought it got too busy and for a long time, I have just listed text. Well today I went back to the idea of trying to squeeze in small logos from each agent next to their text listing. But it ended up looking forced and some of the logos were…well let’s just say some agents aren’t graphic designers and leave it at that (yes I am a snob about such things — with no credibility to judge anyone). Oh and many agents have very nice logos as well. Bottom line with my agents, they are good business partners and that’s what I sincerely care about. But I wanted to create a way for the agent page to stand out a little more and be visually interesting to the reader. Since logos weren’t going to work, I had to consider a unique, common theme. I thought about geography, then cities, then how people know cities, then how cities have nicknames, cities have abbreviations and then…..codes! 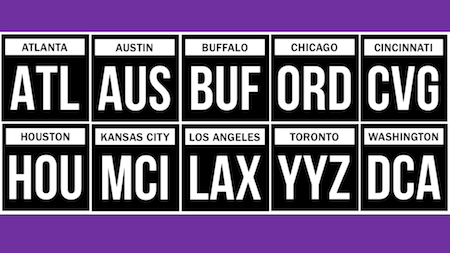 Airport codes!! Of course!!! 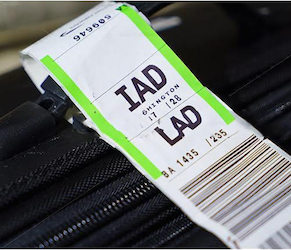 As you know, I am in airports all the time and I often refer to cities by their airport codes. It annoys my family sometimes but I come by it genetically because my frequent flyer Da did the same thing. So there is that memory fueling this idea too. Most of my clients are business owners and many of them travel so there should be an immediate familiarity with this look and feel as well. So keeping with a generic format, I used no unique colors rather just a simple, understated, functional and a bit elegant look…at least in my head. Maybe nobody will notice this except me…and now you because you read this (thanks for that, BTW). But it’s kind of like those studio knickknacks we all have or that special picture or piece of children’s art you keep. It just makes you happy to have them and that’s reason enough to keep them. Until my next idea, anyway. It is always nice to be invited to a party. It means people enjoy your company, you usually have interesting or funny things to say and people generally like having you around. So I was honored yet surprised when I got an email from my friend, fellow Faffer and female voiceover talent Natasha Marchewka a few weeks ago. She was writing an article for Backstage Magazine about the best ways for voiceover talents to secure new business and she wanted to interview me. Naturally, I requested a private plane to NYC, a suite at a 5-star hotel in mid-town Manhattan for 7 days, 24-hour chauffeur, clothing and food allowance (no more than $5,000 per day, as I am not greedy). I also said the 10 tickets I would need for Hamilton on Broadway could be within the theatre’s first 10 rows. Only divas demand front row. I am hardly a diva. Plus sometimes the actor’s spit when they talk and if you’re in the front row…ewww! So Natasha emailed me the questions and said IF (and only if) my answers were any good, she might include them in the article. Somehow I made the cut. 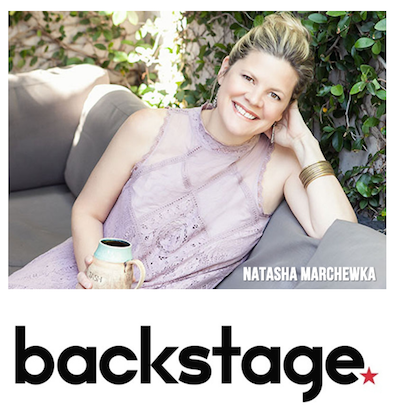 Natasha was very kind to include me at all and the editors of Backstage were also kind not to hit the delete key after seeing my name in the article….sometimes my life can feel like one long edit with a dull blade (old time radio people will get that reference). Here is the link to the Backstage article HERE. In the past when I traveled, I used to bring my portable rig, build a pillow fort, hook everything up and try and make a good recording in a crap environment. For the most part, it worked out OK. The best result was that it would sound OK. That’s pretty much it. Folks who don’t travel alot, like I do, think it’s kinda fun to put all that stuff together. After years of doing all that, you find out it’s monotonous. From the actual fort building and jerry-rigging to getting a shot-gun microphone through airport security without TSA pooping their collective pants (reasonably so as a Sennheiser 416 mic looks very suspicious under the x-ray machine) it gets to be a pain. Bottom line, if I don’t HAVE to bring a travel rig, I won’t. Instead, I use recording studios in the cities I visit. You meet new people, make new contacts and generally enjoy much better recording conditions. Except for that recording session outside of Dayton, OH that got postponed because there was a drug-related murder that took place across the street just before I was set to arrive. And by postponed I mean I cancelled it. Just to avoid the possibility of me getting eternally cancelled. So recent on one of my trips, I was in need of a studio for a rush audition. It was inside a large radio station and being in the station’s production room was like a joyful time warp for me. 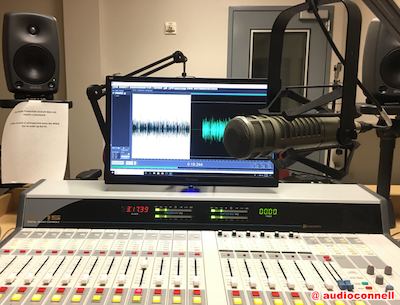 From the board to the desk to the Electro-voice RE-20 microphone (the same type I used in the 80’s when I worked in radio) it was a wonderful place to be. People who used to work in radio (and there are tens of thousands of us) will rightly complain that we were poorly paid, over worked and undervalued. People of work in radio now may say the same thing. But pay and some lousy bosses (and/or owners) aside, it brings most of us real broadcasters to our happy place. Playing the music, mixing the stop sets, the radio station jingles, banter, callers, on-location events – it was all so fun and yet professional. 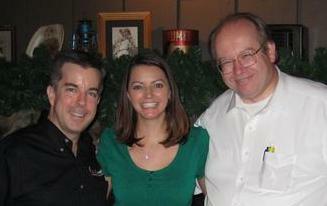 There were and are many very good people in radio. We were serious about doing a good job, being creative, working to make sponsors happy….it could be a good business to be in. This isn’t a gauzy, romanticized remembrance for me…radio had many good parts to it. But by the time I finished with it, the bad parts outweighed the good parts. That’s just how life goes. I completely understand why people stay in the radio business (even for less than stellar wages) and why even a few of my VO friends have gone back into it. Being in that radio studio for my recent recording, it was my brief happy place. And all we all want is to be happy. Nonetheless, clearly it was my civic duty to participate and share my hat collection with the internet. If there is a National T-Shirt Day, I may have to participate in that as well. So clearly I have an over abundance of baseball hats. Why, you ask? There are a couple of reasons beyond that I just like wearing them. As a golfer, I have been a member of the USGA for a long time. And every time you pay for your renewal, they send you a golf hat (really a baseball cap) with the logo of that year’s U.S. Open Championship. So there’s all those. Next, when my boys starting playing little league, their teams would mimic the names of MLB teams, so I would get a couple of hats of each of their teams and their team would change each year. Being from Buffalo, I just couldn’t have one hat from the Buffalo Bills football team, Buffalo Sabres hockey team, Buffalo Bisons Triple-A baseball team and Buffalo Bandits lacrosse team. I hat [sic] to have many. 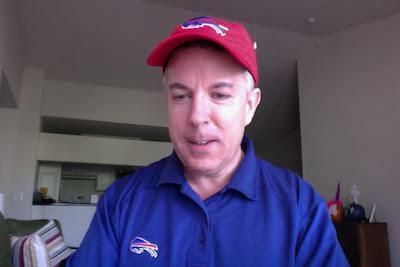 Then, because the Bills weren’t making it in the playoffs, I would get a hat for the NFL team I was supporting in the playoffs to wear to football parties. The Bills weren’t in the playoffs for a loooong time. Then the rest of the hats just sort of accumulated. If I went to a MLB game, I would buy a home team cap if I didn’t already have it. And it grew from there. I’m kind of partial to a particular style of baseball cap. ’47 Brand has a style called The Cleanup. I do NOT wear the standard, boxy baseball style cap seen on MLB players and nothing with half cloth, half mesh (guess I’m a bit of a baseball cap diva). Being from Buffalo, I do have various styles of baseball caps from New Era Cap company. Although I don’t know how many more I will buy from them because New Era Cap is closing their Derby, NY plant, displacing hundreds of workers who helped build the company to what it is today. A majority of their manufacturing is going overseas with only the actually MLB team caps still being made in New Era’s Miami plant . I understand that other manufacturers (like ’47 Brand) make hats in other countries, but I always held New Era Cap to a higher standard, because of local pride. 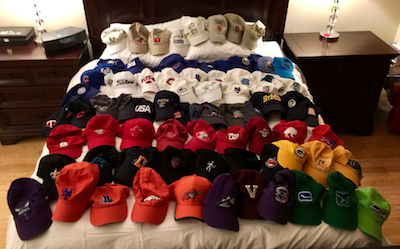 There you have it, the somewhat brief history of my hundreds of baseball caps. More to come! One of the biggest challenges to ANY small business owner (in voiceover or elsewhere) is knowing when to make an important decision. Sometimes circumstances are clear and the business decision seems easy. Most times it’s not. That’s when business owners need to look at as many facts as possible and make the call, decision time. Often, when circumstances and facts don’t seem as clear cut, a decision comes down to the business owner’s instincts. Their gut feeling. 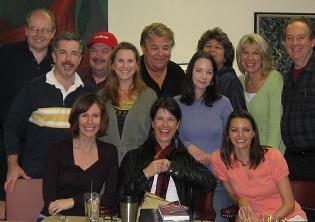 So it was some years ago when I was reviewing the voiceover agents I work with. I had many of them but more than a few were agents in name only. I never saw a lead for a new voiceover job from these few, never got a phone call from these few nor had I had my phone calls to these few returned. Most of my agents did all these things. Not these few. Looking back it on my emails from these few, it had been multiple years since I received any communication from them. Any. That should have been reason enough. Yet, I was hesitant…could this hurt my career if I decided to cut ties with these unproductive voiceover agents? Even though it seemed like they were not doing anything on my behalf, that they weren’t responsive to my communication, maybe (I briefly thought) they had a big job in the offing…maybe I should keep them on for just a little while longer. My gut said no. My instincts told me I had reached out to them enough (and got little to no response) and also that if I met them in person they would not be able to pick me out of an audio or video lineup. So I sent them a professional letter and advised them their “services” were no longer required. I hadn’t thought about that time for a while until I received this advisement email from the Lori Lins Ltd. Talent Agency in Milwaukee, one of the few. was deleted without being read on Tuesday, January 8, 2019 12:13:55 PM (UTC-06:00) Central Time (US & Canada). I had sent the agency a political voiceover demo in 2007. TWELVE years later, the agency deleted the demo email WITHOUT IT BEING READ. Now maybe there is a technical reason for this…maybe a legitimate email went into a spam folder or maybe it got rerouted to a computer that went unused and they just cleared the system. Maybe somebody read it and forwarded it on to a technical person to post on a web site who ignored the email – with the person who emailed it not following up. Or maybe no agent at my agency read the email. Maybe they just ignored it. Based on the service I experienced there (and with the other few), I tend to believe it was the latter. 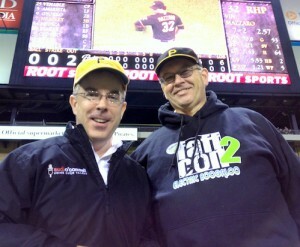 In my opinion, my gut was right to part ways with this agent (and I cut the cord with them after 2007). This recent email notice was one of those “signs” we get in life. I have little doubt they even noticed my departure. I’ve been successful without those few, and hopefully they have been successful without me. It’s not personal, it’s strictly business. I bear them no ill will. But I am reminded by this email notice: go with your gut. 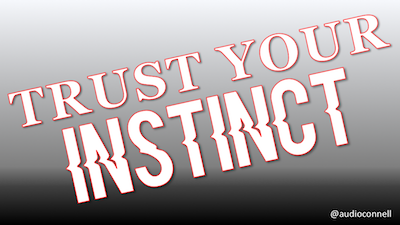 Trust your instinct. As it does sometimes, life can hit any of us right in the crotch. It really hurts. Hard as we try and do the right thing, bad stuff happens…much of it out of our control. But how we react to these whacks that life doles out is what matters. It’s never easy. Sometimes it makes us stronger. Almost always, it makes us more humble. I speak from experience. No doubt you can too. This morning, my longtime friend and fellow voice talent Bob Souer did what I imagine to be a very difficult thing. He started a Go Fund Me campaign to help him overcome staggering debt brought on by family medical bills not covered by insurance. 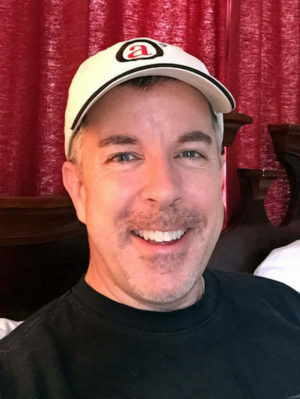 His family faced two major medical issues in 2018 (both Bob’s wife and his daughter). He has publicly asked for our help. I am asking that you financially support his Go Fund Me campaign, as I have. 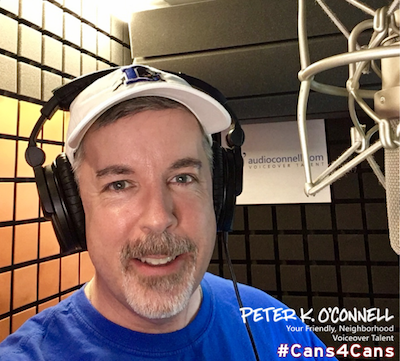 For the 37+ years I’ve been in voiceover, I would be hard pressed to direct you to another voice talent who has so actively tried to share his time and talent like Bob Souer does. He’s quite a generous man. He’s a fairly private fellow too. It could not have been easy to make this public request (it wouldn’t be easy for any of us)…but he did what he had to do after the life whacks his family took in 2018. Now it’s time for us to share some of our treasure with Bob to help him overcome the crushing medical debt he is saddled with. With all of the voiceover community pitching in, no matter the amount, we can help him become whole again. With my thanks, I ask that you please donate now.